Where do I find your dive shop? Diving Caves is located in Playa del Carmen, Mexico. We do not need a facility for our diving activities as we can teach anywhere, from cenote Ponderosa to a cool cafe in town. How do I check in with you when I have arrived here? My divers do not have to check in with me in persona upon their arrival. We do use all modern medias for our convenience like phone, whatsapp, Facebook or email. It is however very important that I get a feedback upon arrival or at least 24 hours before the first excursion that everyhing is in order and the schedule can be followed as planned. I normally also need at that point the room number of your hotel room to facilitate the pick-up without any problems. Can I cancel without any costs? Every confirmed reservation can be cancelled without any costs that day before until 5:00pm (except the first diving day) and the excursion will be postponed to a later date. If for health reasons we are unable to reschedule the excursion, we will refund fully the deposit. Courses will be rescheduled, but I am unable to refund for a deposit for a course if rescheduling is not possible. We will credit for any future booking with us though. Diving Caves is not an anonymous dive shop that assigns just any dive instructor or guide to you. Our service is personal and in order to be able to guarantee that, I need a reservation confirmation along with a deposit so that your personal guide will be reserved for you. I am a new customer and am afraid that I loose my deposit if anything goes wrong and I do not have a physical address to turn to. Of course, I understand that no one wants to just send money to a nobody. But within our email contact I should have sent you all information and contact details necessary and I hope that I do not look like an anonymous contact anymore. Your booking is secured even if your designated guide is getting sick short notice as this is our job to get an adequate back-up. Upon request, I am able to send letters of recommendations from other businesses about us. In the very unlikely case, we cannot fulfill the committment with you and rescheduling is not possible, I of course refund 100% of the deposit for that excursion. Payments can be sent to my bank account in Germany or Mexico or you can pay via Paypal (I have some other possibilities for international payments, so please ask me which countries apply) If you did a desposit, the remainder of the bill has to be paid in cash on spot. (our ATMs accept credit cards, I don’t) I prefer US dollars in cash, but do of course also accept Mexican Pesos or Euros (or Canadian Dollars) based on the mid range exhange rate of the day. Course fees are due in the beginning, packages are to be paid in the end in full including all discounts. What do I have to bring and what is better to leave in the hotel? Your certification card on the first day of your dive vacation. Fit for diving certificate if you need to have an approval of a physician to dive (I ask for your diving fitness, so if any of the questions are answered yes, you need a fit for diving certificate). Ask me for the format by email. Travel documents (in short, do not bring anything, you will not feel confortable leaving unattended in the car, I do lock the passenger cabin and for the last 6 years working as an independent guide nothing has been stolen from a dive site, but this may be also because I do not want to creat any opportunities). Sun creme (you won’t need it in the ocean nor in the cenotes) You do not need to apply another layer, if you get out with me and honestly, the best is to not use any sun cream at all, but to look for the shadow or get a lycra shirt on. Moscito repellent: no matter what you bought, it probably kills everything and is a highly active posison, that you immediatly wash of when you enter the water. During our ocean dives, you will not have any mosquitos at all and in the cenotes I do have biodegradable products with me (and if you stay longer here and would like to use them also during your stay in your hotel, I will explain where the best places are to buy them). Drinking water; especially, if it is the small water bottles that the resort supplies for excursions. The only way we need to go to reduce the amount of plastic (recycling is a very new concept in Playa del Carmen and we all know since our German Green Point tat this does not solve the problem) so we need to reduce, and you can do that by just not taking those bottles. I bring fresh water in BPA free, reusable drinking bottles every day for each diver. I also work on finding ways to avoid one-way plastic packages for juices or our lunch packages. What happpens with my diving equipment after the dives? Equipment like BCD and suits can be stored with me in a secured and ventilated room in my house (my 7 dogs are my security) and of course also the rest. I recommend to take dive computers, lights and cameras to your room as you need to recharge batteries, download data etc. Having more FAQ’s? Let me know and I add them to the list. This is a shot of 2007 and it is reported that the famous Barbie of Dos Ojos is gone now. 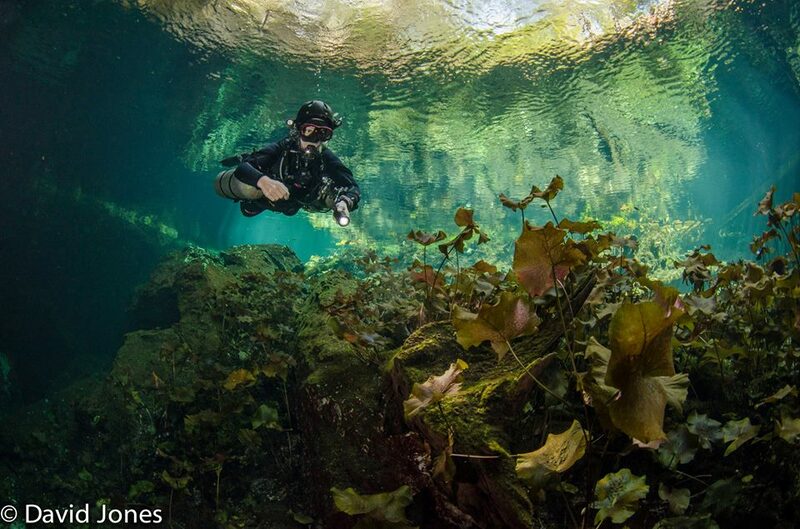 From cenote Carwash, a shot from a typical dive in summer. In winter, cenote Kukulkan is just a dream for any photographer and all that want to enjoy the beauty of nature.